Try Continuous Ink System with your Brother MFC-3420C and make 30 times more quality prints for the same money! Pay only 0.04 USD for A-4 full color print! Ink System for Brother MFC-3420C: Effective Saving on Inks! The CISS Brother MFC-3420C continuous ink supply system is a unit of interconnected vessels, which is intended to feed inks from external donor tanks to printer cartridges, as soon as they run out. The inks are supplied through elastic tubes, which connect printer cartridges with ink tanks and together form a flexible multi-channel cable. 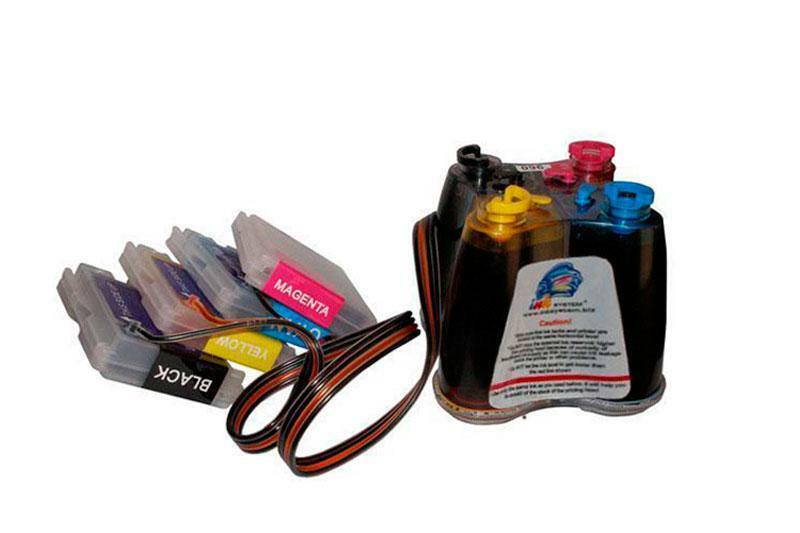 In the process of printing ink run-out creates underpressure within the cartridge chamber which makes the ink move through the tube to refill the chamber. There are two types of printers according to the print head design. One of them uses a built-in (fixed) print head and the other uses a disposable one, which is supplied as a part of a replaceable cartridge. As a rule, it is reasonable to use the CISS MFC-3420C in printers with fixed print heads, as well as similar system models CISS for Brother MFC-3820CN and CISS for Brother MFC-620CN, because these type heads have long duty cycle. Nevertheless, such system can be installed onto a disposable PH printer. When the CISS Brother MFC-3420C is used at home, it helps to significantly save money and time for printing photos and any other color products. For example, a 10 x 15 cm photo will cost you almost nothing! Now due to the CISS the cost of inkjet printing is lower than that with a laser printer. The CISS ink system Brother MFC-3420C will let to extend your business with additional kinds of service. Color printing, direct printing from digital carriers, printing photos, posters and other advertising stuff will get profitable, as soon as you start to use the CISS for MFC-3420C. 1. The CISS for Brother MFC-3420C is easily installed onto the printer. 2. The CISS installation procedure is reversible. After its dismantling, no traces of its usage will remain. 3. Its installation does not need any interference inside the printer. The printer casing or other parts will be free from any damages. 4. The ink supply system is installed without disassembling the printer. 5. The system is provided with permanent chips, therefore there is no need to zero it with a programmer either to restore ink level values in the system chips. These operations are carried out automatically. 6. The ManufacturerвЂ™s warranty remains valid. The ink level in the capsules is controlled visually, which is very convenient. 7. The tanks are easily refilled with inks. 8. The external ink donor tanks are quite capacious. Their volume is 10 вЂ“ 15 times as large as that of a standard cartridge, which is enough to print about 5000 photos of 10 x 15 cm size without refill. 9. The continuous ink supply system has low price. It costs as little as one set of original cartridges.